Foshan was founded under the Jin dynasty (265-420) and thus renamed under the Tang (618-907). Foshan, which is among the four oldest Chinese cities, is located in the Guangdong province. Foshan is simultaneously the cradle of Cantonese opera, Lion Dance and Kung Fu. Most of Kung Fu styles from the south of China were born and developed out there: Hung Ga / 洪家 拳 , Ving Tsun / 詠春拳 commonly named Wing Chun, Pak Mei /⽩白眉拳, Long Yin / ⿓龍形拳, Choy Li Fat / 蔡李李佛拳 and Liu He Ba Fa / 六合⼋八法拳. Foshan is renowned for its ceramics and porcelain - Shi Wan, the oldest kiln, started operating under the Tang dynasty. However, its reputation was mainly built through martial arts. The Ancestral Temple Zu Miao / 祖庙 in the city center is dedicated to the Taoist divinity Beidi, the North Emperor. It was founded under the Song dynasty (960-1279). Inside this temple, the Wong Fei Hong / 黄飞鸿 memorial was built in honor of this Kung Fu master. Wong Fei Hong was also a renowned medicine practitioner and was famous for the quality of his Lion Dance. Ever since the best Lion Dance team in Foshan has been performing in front of the memorial, in honor of Wong Fei Hong. The Yip Man memorial is also located inside the Zu Miao temple. Yip Man / 叶问 was a Ving Tsun Kung Fu master from Foshan. Bruce Lee was one of his disciples. Today, the practice of Martial Arts in Foshan remains very popular. This was illustrated in 2007, during the inauguration of the Foshan city stadium: 18,000 martial artists made demonstrations on this occasion. Lion Dance is sometimes named Dragon Dance or Unicorn Dance. This is a very popular show, highly reputed in China. 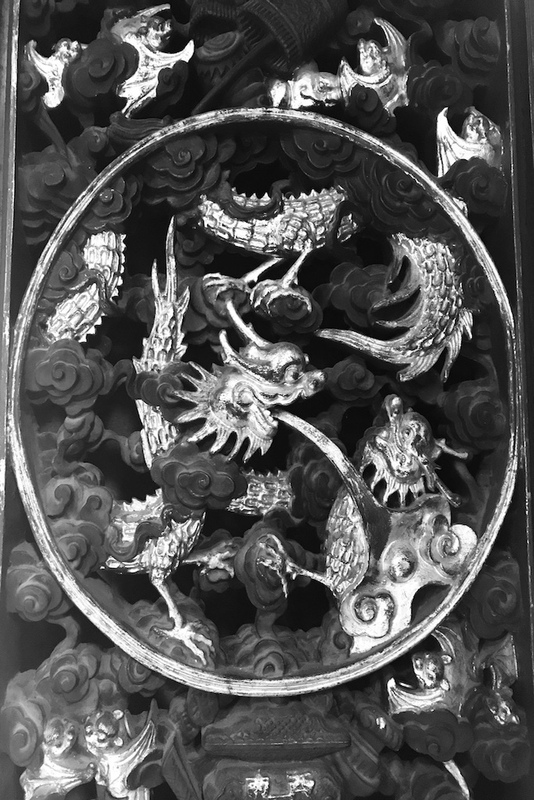 It is supposed to drive away malevolent spirits and to bring happiness and prosperity. 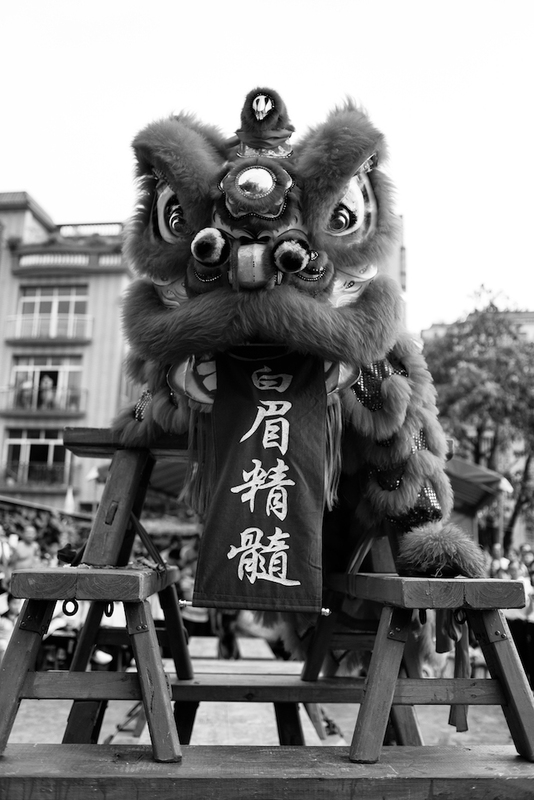 According to legend told by Sigong Chan Yau Man, Lion Dance was created during the Qing dynasty. Ferocious beasts repeatedly stormed a village near Foshan, terrifying the population and destroying harvests. As a riposte to this threat, the villagers decided to build a legendary Lion with feathers and canvas. They put it at the center of the village in order to scare the beasts. As the attacks stopped, the villagers attributed credit for this victory to the Lion, and chose to celebrate it every year. Nowadays the Lion is still considered a symbol of happiness and prosperity that accompanies important occasions such as the Chinese New Year, birthdays, marriages, funerals, or events such as the inauguration of stores. Fei Hung. Since then, their movements have evolved into some quicker and tonic moves: "the seven stars" / 七星. Under the Lion, two dancers one moving the head and the other one moving the body breathing life into to the mythical animal through choreographed moves. The Lion may move on the ground, on benches or poles, according to the place where the dance is executed and to the agility of dancers. The color of the lion depends on the Three Kingdoms hero that it personified: saffron for Liu Bei / 刘备, red for Guan Yu / 关⽻羽 and black for Zhang Fei / 张飞. Drinking tea is far from the ceremony that we often hear about; it is the pleasure of an instant. It has a special importance in the practice of Kung Fu, where it both symbolizes sharing and transmission. The perpetual consumption of tea is very dear the Chinese heart may be explained not only by the taste of Chinese people for tea, but also through the evolution of its perception in China. The discovery of tea, and of its medicinal virtues, is attributed to Shennong / 神农. Shennong is the Chinese god of agriculture and medicine. According to the legend, the god got poisoned during an experiment but was able to detoxify himself, thanks to the infusion of a tea feather. At the beginning, considered as a remedy, tea became the standard beverages under the Han dynasty, while it was spreading to Sichuan and Yunnan thanks to Zhu Ge Liang / 诸葛亮, also named Kong Ming. In honor of this illustrious strategist of the Three Kingdoms period (220-265), tea plants are surnamed "Kong Ming trees". 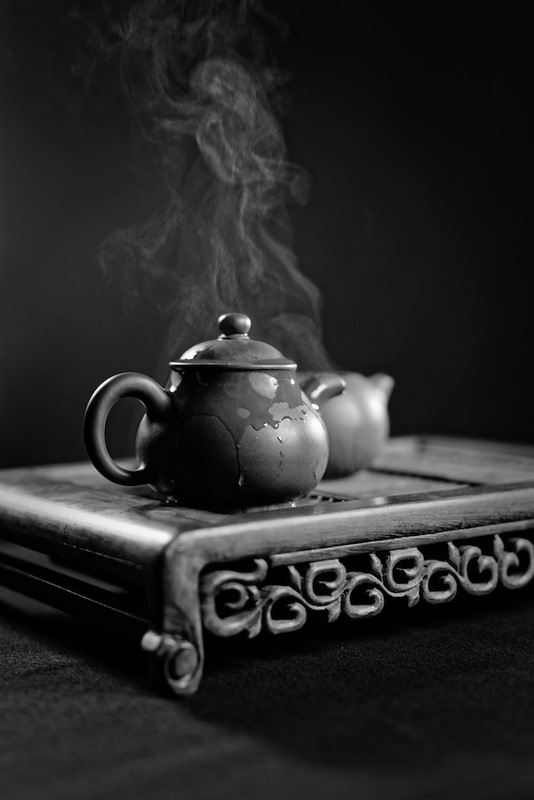 Finally, under the Tang dynasty, tea was considered as art, just like poetry, painting or calligraphy. Even though, tea serving is called Kung Fu Cha ceremony / 功夫茶 in China, it is mostly a way of preparing it rather than a solemn ceremonial such as the Japanese one. Very popular in the Guangdong province, Kung Fu Cha seeks the best expression of the tea aromas and flavors, as it is said to calm and invigorate the mind. Moreover, tea shares strong links with Taoism, Buddhism and, thanks to its refreshing mind opening qualities, represents the meditation drink of choice. Kung Fu Cha is linked to the practice of Pak Mei since it represents a sharing moment between learners, disciples and master who always get together for a cup of tea before and after training. The disciple ceremony, which represents one of the key moments in the life of a Kung Fu school and of the learners’s one. The ceremony is performed with the form of a tea ceremony during which the student kneels in front of his master to offer him a cup of tea, which is symbolizing the person will and respect, as he want to become his disciple. During this ceremony, the disciple briefly expresses his motivations, while the Sifu grants him a few words of advice before drinking the tea and receiving the red envelop / Lai Si from the disciple. Opera is at the heart of Cantonese culture. It involves the most prestigious musicians and singers as well as martial artists. Opera links music, singing, costumes and traditional music instruments to depict either scenes of the Chinese everyday life or epic stories of the Imperial period, such as fights with weapons inspired by Chinese martial arts. The creation of the Chinese opera is commonly attributed to the Emperor Xuanzong of the Tang dynasty, who wrote « The Peach Garden ». The first troupe of Cantonese opera Qiong Hua was formed during the Ming dynasty in Foshan / 琼花会馆. Martial artists, or even Kung Fu masters, used to be frequently present in troupes, since they could contribute to the creation of martial choreographies. They could also contribute to the security of the troupe by teaching them how to defend themselves. Martial artists in touring companies used to defend them and their material, as well as their revenues. The WanFu stage in the Ancestral Temple of Foshan used to be a major place for performances. In memory of traditions and of the past, the Foshan city keeps a particular attention toward Cantonese opera. It contributes to the spreading of opera through the creation of the Cantonese opera school that was founded in 2003 with the support of the Guangzhou department for Chinese culture. The traditional Chinese medicine comes from the Taoist principles of yin and yang along with the five elements. Several types of practices whose the most notorious are : acupuncture, herbalism and massages. All of them linked to the same principles inherited from a more than 2,000 years old tradition. Kung Fu Masters use Dit Da / 跌打, which aims to heal different external traumas such as contusions, sprains and even fractures. This orthopedic medicine allows Kung Fu Masters to heal when they hurt themselves but also to perfect their Qi Gong practice. Wong Fei Hung, Kung Fu Hung Ga master, was also particularly renowned for his Dit Da. 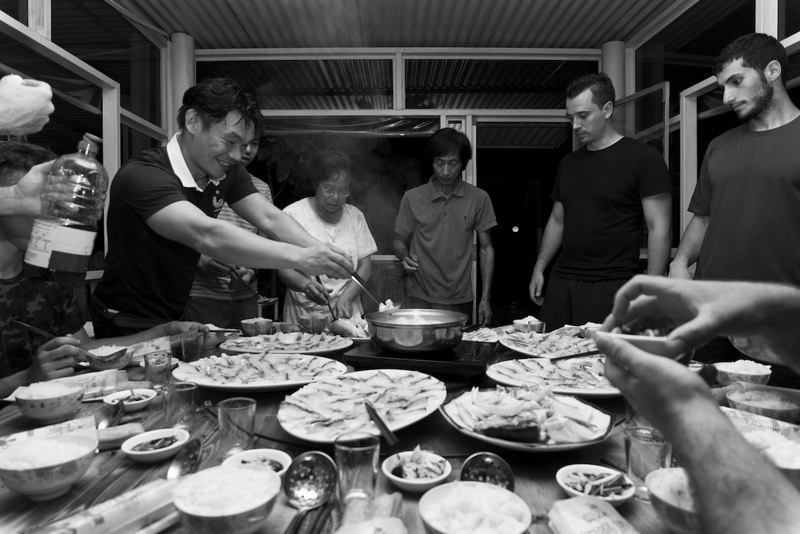 Among the traditional Chinese medicine, the LWS Pak Mei School Sifu uses Dit Da Jiu / 跌打酒, a decoction based on roots and plants that he learnt to make thanks to his friend and brother in arms, Sihing Pang, a Foshan doctor, specialized in herbalism and physiotherapy. Dit Da Jiu is used by the Kung Fu disciples, particularly throughout their muscular reinforcement and bone hardening work.